The NC State University College of Veterinary Medicine conducts clinical research as part of the mission to advance veterinary knowledge and improve animal health. These investigations are open to qualifying clients of referring veterinarians and the NC State Veterinary Health Complex as well as members of the animal-owning public. The Neurology Service is seeking dogs that suffer from seizures to participate in a national canine epilepsy study investigating a new medication to treat certain seizures. Epilepsy is the single most common neurological disorder in dogs and it is estimated that each year up to 780,000 dogs are diagnosed with the disease. Dr. Karen Muñana, a board-certified veterinary neurologist, is assessing canine patients in the trial that is sponsored by a major animal health pharmaceutical company and is regulated by the Food and Drug Administration. The Comparative Pain Research Laboratory (CPRL) is conducting two studies. One investigation involves healthy terriers, spaniels, or poodles who could receive free veterinary services valued at $300 if they qualify for a study of how heart disease affects a dog’s quality of life. The participating dogs will be members of control group whose daily activities Dr. Bernie Hansen, an associate professor of critical care and co-director of the CPRL, will measure and compare to the activity of dogs with early or mild heart disease. There are three openings remaining, one each for a spaniel, a poodle or poodle mix, and a Cavalier King Charles Spaniel. A second CPRL study seeks participants for a trial of a new biological compound being tested to treat canine osteoarthritis pain. The study will evaluate the efficacy of a biological compound that is antibody against nerve growth factor, which is an important promoter of pain in arthritis and many other diseases. Dr. Duncan Lascelles, a professor of surgery and pain management and CPRL co-director, says the antibody is expected to decrease the pain-producing effects of nerve growth factor in dogs. An orthopedic study involves American Kennel Club-registered German Shepherds and Labrador Retrievers. These participants receive a free orthopedic examination and x-rays as a benefit for their involvement in a trial that provides important information on the popular breeds. Dr. Kyle Mathews, professor of small animal surgery, is conducting the study which is focused on the attachment between the dog’s spine and pelvis. It is currently unknown how the angle of this joint—which varies widely in dogs of the same breed—affects other joint angles and the development of the skeletal system in the hind limbs. The Dermatology Service also is conducting two clinical trials. One study is seeking dogs suffering from chronic itching or skin lesions to participate in a study of a novel biologic treatment for canine atopic dermatitis. Conducted by Dr. Thierry Olivry, professor of immunodermatology, dogs enrolled in this investigation should have signs of moderate or severe atopic dermatitis that fail to completely respond to standard-of-care therapy such as steroids or cyclosporine. Alternatively, the dog could have suffered from allergies that responded to therapy, but with side effects so severe that treatment had to be stopped. The second study is a two-phase clinical trial that will test the efficacy of an injected drug developed to calm nerve endings responsible for chronic itching. Investigators would like to have 10 dogs participate. 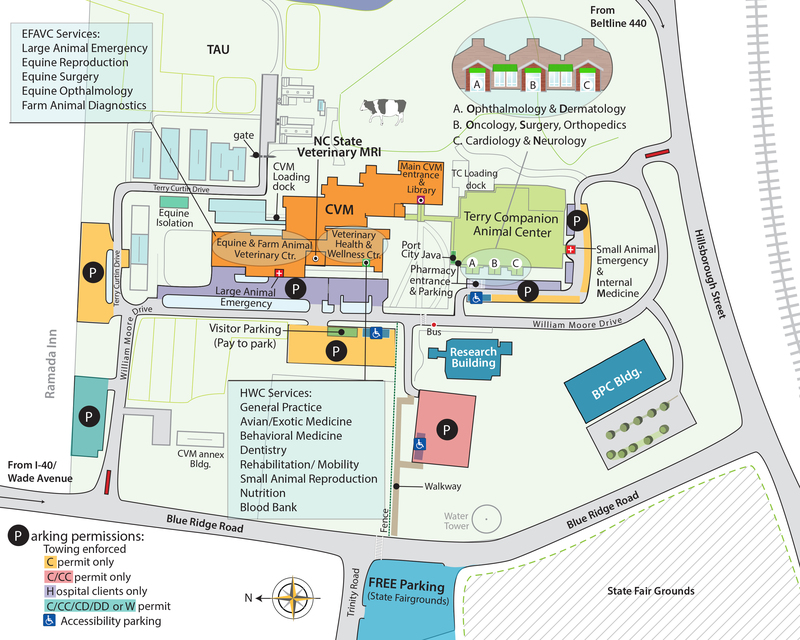 Referring veterinarians and animal owners may review a complete list of all 25 current clinical trials underway at NC State Veterinary Health Complex by visiting the Clinical Studies Core, a component of the Center for Comparative Medicine and Translational Research. For additional information on any study, see the contact information or email the Clinical Studies Core (CSC) at ccmtr_csc@ncsu.edu.